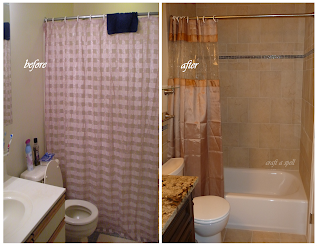 This time last year, we underwent another home renovation project. I say we but I mean my parents. I was in Scotland at the time and had to wait months before I could see it in person because they didn't start the construction until after I had gone back to school after Christmas break. But even abroad I could see the proof in the pictures - it was amazing and oh so fancy. Before the walls were taupe (even before that they were wallpaper but my mom and I tackled that a few years ago) and now they're covered in lovely tile that goes up to just about my elbow and has a strip of brown glass tiles running around it. We got a completely new bath tub and toilet. The before picture has the curtain shut so here's what it looked like inside - yuckyuckyuck. Does that old vanity look familiar? Yes, it's the same type we had in our kitchen. 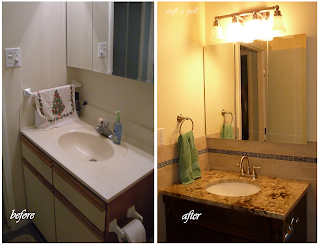 We got a new vanity with granite counter tops, changed the light fixture (you can't see it but think Hollywood make up mirror bulbs), and changed all the fixtures upstairs to brushed nickle. The mirror is the same - we changed that when we removed the wallpaper a few years ago. Ah, I specifically remember the corner bashing me on the head. Fun Painful times. And can you see the old tile in the bottom left corner? Light blue with dirty grout. Eckh. 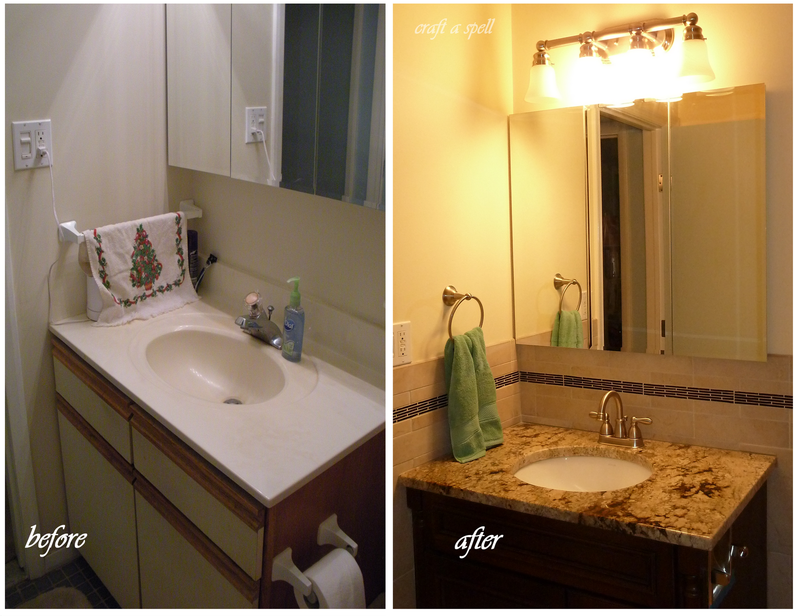 2011 sure was the year of renovations in our house! We redid the computer room by adding bead board (again by we I mean they - I wasn't home). Of course, no before pictures were taken - just imagine no bead board and dirty walls in need of a fresh coat of paint. Now if only they would change the ceiling tiles to something clean and white. Is it obvious this is our 'office' aka 'stuff a bunch of desks and files cabinets in there' room? This renovation has been linked up at these parties. Thanks for sharing and linking up at my *Get Creative* party! 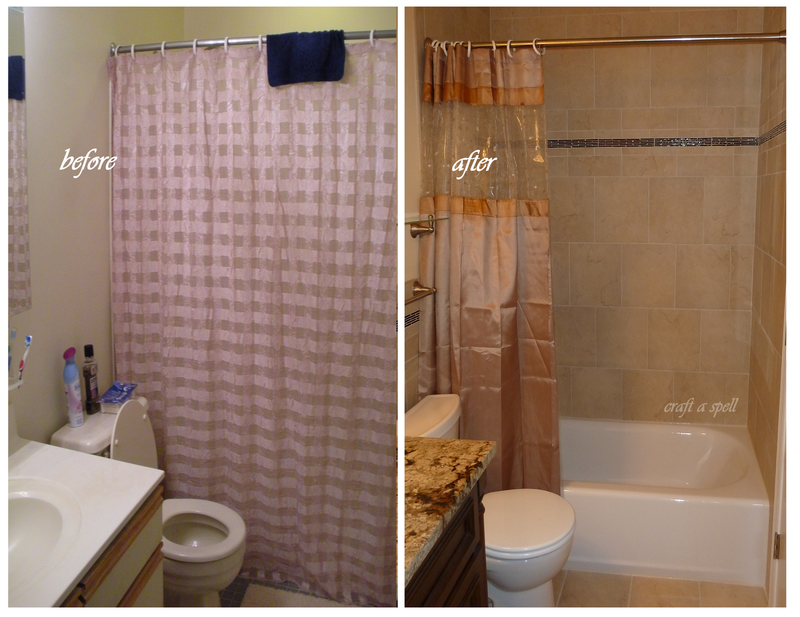 The tile in the shower made a huge difference...so pretty! Thanks for sharing at A Couple of Craft Addicts! Blog lover here ...next time you go shopping please include me! !